Turkish public prosecutor’s offices on Sunday issued detention warrants for at least 41 people on accusations of disseminating the propaganda of the Kurdish Democratic Union Party (PYD) and the Kurdistan Workers’ Party (PKK) in social media messages concerning a Turkish military operation in the Afrin region of Syria, the state-run Anadolu news agency reported. According to the report, detention warrants were issued by the Istanbul and Diyarbakır public prosecutor’s offices. Fuat Yaşar, a pro-Kurdish journalist, tweeted that Turkish writer Nurcan Baysal and jpurnalist İshak Karakaş were detained by police early on Sunday while the houses that belong to journalists İsmail Eskin and author Aziz Tunç were raieded by counter-terrorism teams. Journalist İsris Yılmaz was put in pre-trial detention by a Turkish court while Sibel Hürtaş was taken into custody later the same day, Yaşar tweeted. The Turkish Armed Forces backed by armored vehicles, special forces and infantry regiments have advanced five kilometers inside Afrin, which is controlled by the PYD. Turkey views the PYD as the Syrian extension of the outlawed PKK. The Ankara Chief Public Prosecutor’s Office earlier on Sunday announced in a statement that investigations had been launched into individuals who have called on people to take to the streets to protest Turkey’s operations targeting Afrin. The Ankara Chief Public Prosecutor’s Office on Sunday launched an investigation into pro-Kurdish Peoples’ Democratic Party (HDP) deputies Ayhan Bilgen and Nadir Yıldırım for “incitement of hatred and hostility” through their critical messages on Twitter over Turkish military operation in Afrin. “If anyone is in the streets upon calls [from the HDP], they will pay dearly for it. This is a national fight, and whoever opposes us will be crushed.” Erdoğan added. Sabahtan şimdiye… Yazar Nurcan Baysal ve gazeteci İshak Karakaş gözaltına alındı. 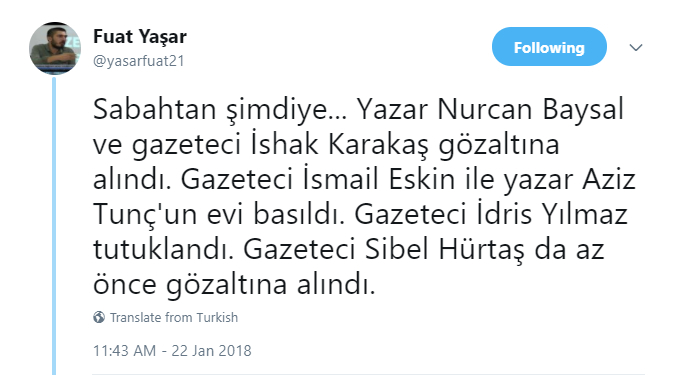 Gazeteci İsmail Eskin ile yazar Aziz Tunç'un evi basıldı. Gazeteci İdris Yılmaz tutuklandı. Gazeteci Sibel Hürtaş da az önce gözaltına alındı.